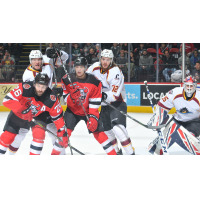 BINGHAMTON - The Binghamton Devils held on for a 5-4 victory over the visiting Cleveland Monsters on Saturday night behind a four-goal second period in front of 3,801 at Floyd L. Maines Veterans Memorial Arena. The Devils caught a break to take a 1-0 lead at 13:32 of the opening period. Marian Studenic sent a shot on net that deflected up and over the shoulder of goaltender Jean-Francois Berube for a one-goal lead. The goal was Studenic's 10th of the year with the lone assist to Egor Sharangovich. Blake Speers helped set up Brian Ward's first AHL goal to give the Devils a 4-1 lead at 15:25 of the second frame. Speers cut into the offensive zone and fed Colton White who found Ward in front of the net for the three-goal lead. Just 30 seconds after Ward's goal, Saracino gave the Devils a 5-1 lead as he beat Berube, unassisted, at 15:55 and Binghamton took a four-goal lead into the final period with the shots all even at 20. In the third period, Cleveland scored twice in the first 3:02 to pull within two as DeSalvo scored his second of the night and third of the year at the 1:38 mark. Vitaly Abramov put one in 34 seconds later for his sixth of the season to decrease the Devils' lead to two, 5-3. Cleveland pulled Berube late in the game and made it a one-goal game 2:07 remaining. From the goal line left of Cormier's net, Scott sent the puck off of Cormier and in with assists from Broadhurst and Clendening. The Devils' lead was cut to one with the net still empty for the remaining of the game. Binghamton held off a late push and the Devils secured their fourth win in a row, 5-4. Cormier stopped 32 of 36 for his third win in a row, and of the week. The Devils are back home Wednesday night as they host the Hershey Bears for the only time this season at 7:05 p.m. It's the final Dollar Dog Night where fans can score $1 Nathan's hotdogs, $4 beer, and kids 12 and under get $10 tickets!